The Family record provides a centralized area to house and reference all information related to a specific family (or account). Each family page has its own tabs, buttons, links, and user-defined fields. The terms Family and Account may be used interchangeable in Jackrabbit. Tabs in the Family record allow a user to see and work with specific details related to a family. A summary of the family information, including important Primary Contact Information and key Student Information. Contacts are not limited to a student's parents and can be customized. Additional Contact Types are created using Tools > Edit Settings > Drop-down Lists. A summary of contact details is available on the Contacts tab. Click the View link to view information about a specific contact. Emergency contact information is also listed on the Contact tab. The Schedules tab provides details for all current and future enrollments for all students within the family. The Events tab screen provides all current & past event enrollment details for the family. Where enrollment has been by student (versus by family) the student's name is shown. The Transactions tab screen previews the last 20 (most recent) transactions (fees/charges & payments) for a family. Clicking View Transaction History provides the family's entire transaction record. Clicking View Unapplied Credits & Unpaid Fees displays a listing of transactions which can be helpful when correcting linking errors. The Billing Info tab contains all of the billing details that have been set for a family. The Misc tab offers any other recordable family information. Click the View Registrations button to view any parent portal, web registration, or quick registration details for a family. Only registrations with an email address are maintained in this area. Click View Sent Emails to see the email history for the last 180 days. Notes (400 character limit) entered on the Notes field on the Misc tab are private and are NOT viewable by the family when they are logged into their Parent Portal. Buttons in the Family pages allow you to perform specific actions for a family (post fees, enter payments, etc.). The Make Sale/Post Fees button is one of the ways a user can post fees to a family. Clicking Post Fees brings up a Post Fees screen. After entering the fee details, remember to Save Changes. Once a fee has been posted, it is visible under the Family's Transactions tab. Use the Payment button to enter a family's payment. Clicking the Payment button brings up the Payment Transaction Entry screen. The Refund button opens a screen showing the last 20 payments a family has made and allows a user to choose a payment to refund. For more information on using the Refund button, reference the Post / Enter a Refund topic. Print or email a statement for an individual family using the Statement button. Click the Add Student button to add a student directly to a family. Enter the student first name, last name, gender, and birth date and Submit. Add additional contacts to a family using the Add Contact button. Use the Archive Family button to archive a family to your Lead File. See the Lead File topic for more information. Use this button to rename a family. In the Rename Family pop-up box, enter the new name and indicate who the change should apply to. Save Changes. Use the Email button to email a family. Once clicked, all email addresses associated with a family will appear in a pop-up window. Check the email addresses intended for the email and Submit. The Email Families editor screen will appear. Choose an Email Template or create the email. Click Preview Email List. Click Send Email to send the email. From the Family record, click the Email Schedules button to email the current class schedules for all active students in the family. Optionally, you can email schedules to multiple families from Tools > Students > Email Student Schedules. See Email Student Schedules for more information. Use the Merge Family button to set the family as the From family and initiate the merge of the family record into a duplicate family record. See the Merge Duplicate Family Records topic for details on how to merge family records. There are five user defined fields available in a Family's Misc tab. These fields can be used to record specific information important to your organization. Ensure that you have consistent information entered for accurate searching using Families > Search. Edit the User-defined Field names, using Tools > Edit Settings. Choose User-defined Fields from the left menu. User-defined Fields can be used to capture information during online web Registration. To learn more about how your organization can utilize User-defined fields on the online registration form, please refer to Web Reg Form: Field Options / Labels. 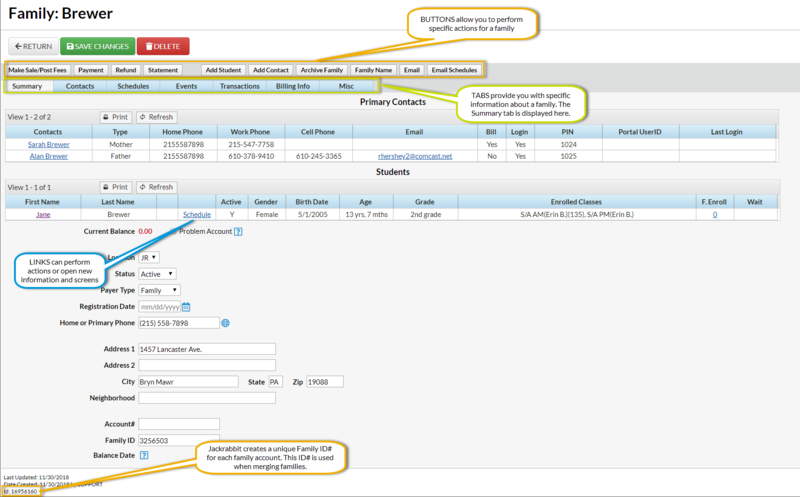 User-defined Fields can also be used on the Parent Portal. Refer to Set Up the Parent Portal page. You are able to clear the information captured in the user-defined fields in mass from the Families menu > Clear UDF Answers. This will update family information by clearing the answers in the User-defined field on the Family Misc tab for all families. The User ID must have the families permission Clear Answers in Student User-defined Fields (UDF).